Take the train from the Leipzig airport to Halle(Saale)Hbf, then a train to Aschersleben. Leipzig train runs every 30mins and is $16. The Halle(Saale)Hbf train runs every hour and is $25. The shortest route from the Harz Mountain is the A14 or B6n. Halle/Leipzig is the closest international airport and is just 46 miles away. Please check specific venues for visiting hours. Aschersleben is a historical centre that has impressive architectural styles of great historical value. This town has a 1250 year history and is a delight to see. As the oldest documented city in Saxony-Anhalt, Aschersleben is a gold mine for architecture buffs. Romanesque, Gothic, Renaissance, Baroque, Classicist, and Art Nouveau structures can all be found here. The history of Aschersleben dates back to AD 753. The medieval town wall has 15 watchtowers, which is approximately two kilometres long, is still intact and is especially worthwile to see. The city of Aschersleben knew exactly what visitors were looking for and created three distinct, well-marked tourist routes throughout the city. The first leads you past all of the major architectural highlights, the second highlights the city's fortifications, and the third focuses on the beautiful gardens and parks of Aschersleben. Take advantage of these paths and enjoy of all the amazing sights along the way. Definitely make sure to take a stroll along the "Promenadenring", which is an idyllic path that takes you in a 2km loop along the historic city walls. Admire the well-maintained towers and catch glimpses of the old city fortifications while enjoying the beautiful greenery along the path. For even more beautiful greenery, head to the large Herrenbreite park, which has stood here since the 15th century. You will find beautiful fountains, sculptures, and flowers throughout the park, and you can even relax with a beer in their perfectly positioned beer garden. What could be better? Besides the beautiful sites there are many cultural activies and lots of entertainment. The annual festivites are well known in the region and attract thousands. There is for example the political cabaret and Autumn Blues Festival in November. There are also concerts given by the Philharmonic Chamber Orchestra “Ascania”. Their modern sports and leisure centre ”Ballhaus” has beach volleyball facilities, a rock climbing wall and a swimming pool. If you visit during the summer, the 1000m2 outdoor swimming pool is the best place to be. Visitors can hire a rowing boat, a pedal boat and boat on the adjacent pond called the Gondelteich. There is also a large sauna bath to come and relax in. Another must see is the Aschersleben Zoo. It has about 500 animals and an amazing 2,000m outdoor enclosure for Siberian tigers. The zoo also has a planetarium for you to travel the universe. Come see all the different historical architectural styles of the town. You can see the styles in the churches, Grauer Hof, and the entertainment venues. Check out the political cabaret, Autumn Blues Festival, and the Philharmonic Chamber Orchestra. 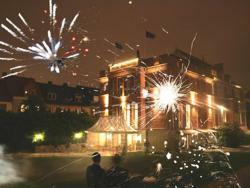 Visit the zoo and the sports and leisure centre, Ballhaus. You can rock climb, swim, rent a pedal or rowing boat, or relax at the large sauna bath. 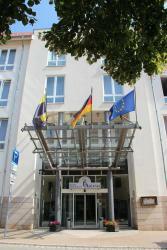 Offering free Wi-Fi and views of the park, this family-run hotel is situated in the centre of Aschersleben. Guests can relax on the terrace, with an outdoor pool available during the summer months. This privately-run 4-star hotel offers a free buffet breakfast, and regional cuisine. It is centrally located in the historic town of Aschersleben, just 200 metres from the Stephanikirche church. Set in the historic town of Aschersleben, this 3-star hotel is just 1.5 km from Ballhaus Sports and Entertainment Complex. It offers an inviting restaurant and spacious rooms with Wi-Fi access.